Saturday is the holy day for all Jews in world. This is a well known part of the Jewish customs. During Saturday they exchange greetings, saying "Shabbat Shalom" or "Peace Saturday". Under the Israeli occupation in West Bank and Gaza since over 41 years, the Palestinians never lived one day of peace, even not one Saturday. The Jewish State turned their "Shabbat Shalom", the Peace Saturday, into a BLOODY one. 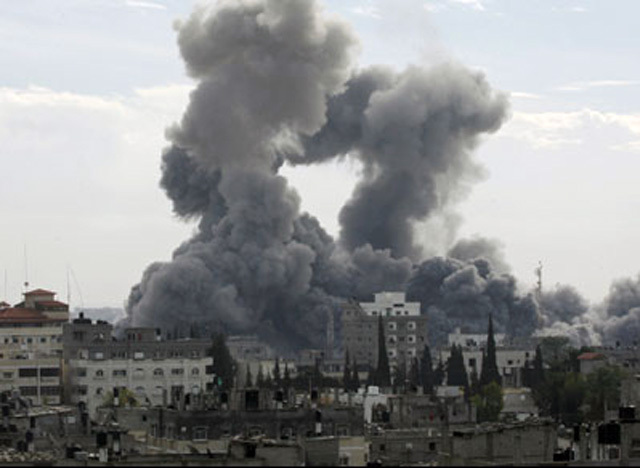 In Gaza, today one million and a half Palestinians lived a "special day" of the Jewish "Shabbat Shalom", after over 60 airplanes of the war criminal Israeli air forces launched strikes during the holy Shabbat, murdering over 205 and injuring over 740, while targeting the Police headquarter in Gaza. Among the victims at the police headquarters are over 120 dead civilian. The count of victims increases each moment. The Israeli war against humanity has just started, according to the statement of war criminal Ehud Barak during a press conference. During Bloody Saturday in Gaza, The people had to pick through body parts in order to identify their loved ones. It�s horrible to describe the images of people collecting body parts of human beings. Yesterday the Israeli occupation allowed the entrance of food into the Gaza concentration camp. The journalists filmed the human face of the Nazi occupation, all the International media broadcasted the scenes of food entering Gaza. I saw hungry children like butterflies running in front of the food trucks, they all were happy that their starvation would now end. The Israeli government decided to end the starvation of children in Gaza, but in another way and for ever. The IAF dropped approximately 100 bombs, with an estimated 95 percent of the ordnance reaching its intended target of murdering the hungry children. 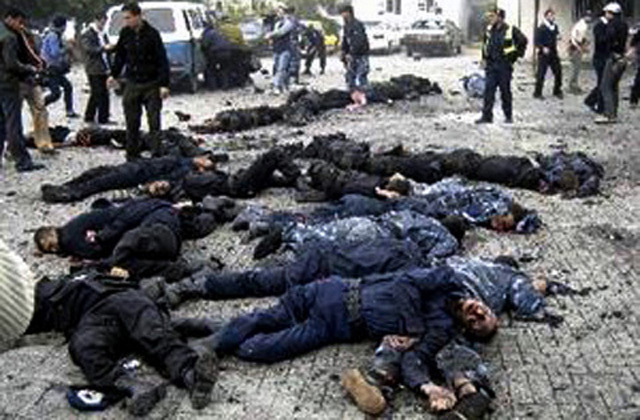 Most of the casualties of the bombings were innocent civilians. The people are not able to identify the victims who had been in the streets or visiting the offices of Hamas for their civilian affairs, I was told by people from Gaza during a phone call which I made. They added that the Israeli air strikes began at 11:30 with almost no warning for the civilians in these offices. 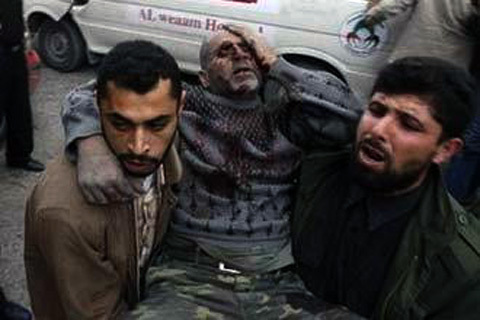 Many children, men, women and civilians were killed. Sameh Habeeb, a Palestinian journalist from Gaza, said that the Palestinian victims were a mix of policemen and civilians who were visiting some police stations to request personal documents (ID cards, passports, �). 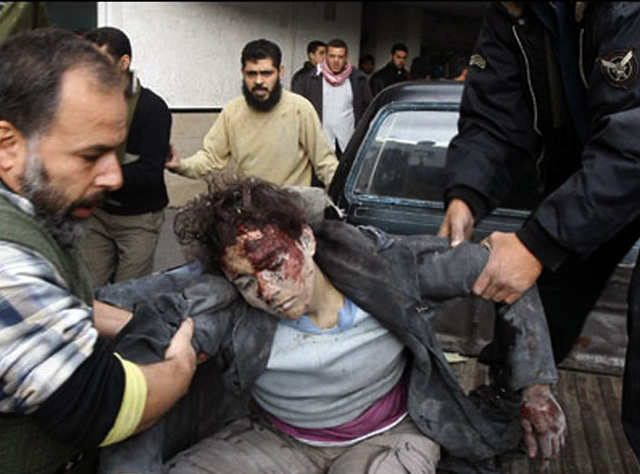 The police station witnessed the bloodiest Israeli attack in which around 70 were killed, mostly policemen. The victims at the police station were holding a graduation ceremony for a group of young police cadets. A family of 9 members, 15 young children, and some women were killed but could not be identified. The Ministry of Health is not able to recognize the ID�s of casualties. Tawfiq Jaber, Director of Gaza police, was killed in the air raids along with Ismail El Jabari, head of the security section in the police. 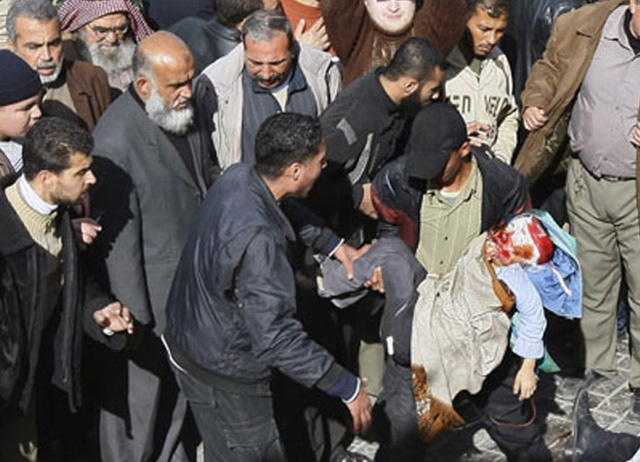 The governor of the central Gaza governorates and camps was killed as Israel hit his car. Palestinian medical sources said that over 205 people had been killed and more than 750 people were also wounded during the Israel Air Force strikes and crimes. Many critically injured were transferred to Egypt, which has opened its long-sealed border with Gaza, to allow transferring the wounded people for medical treatment in the hospitals. The wounded were being transported in inhuman way in trucks according to witnesses. 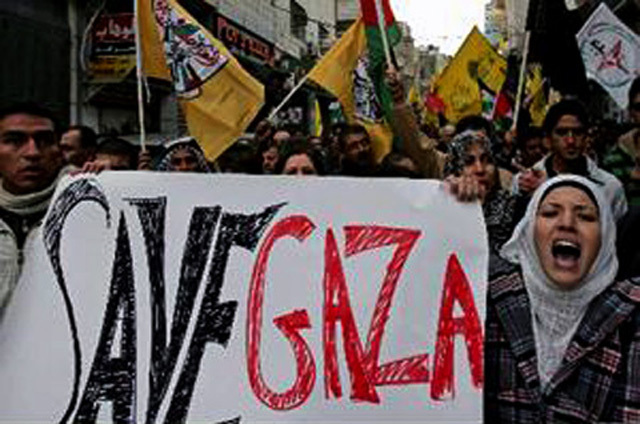 The capacity of the hospitals in Gaza is severely limited under the Israeli blockade, the heavy air strikes, the lack of the medicine, and the increased number of injuries, said the same sources from Gaza. The images of the Israeli war crimes, hundreds of the dead bodies and injured people in the streets, the disgusting images of Israelis dancing of joy in the streets, shows the real face of the Shabbat Shalom of the Jewish State of the Israeli occupation, this "holy chosen people" of thieves and murderers. Israel and USA used the Arab and other foreign countries, among them Egypt, Saudi Arabia, the Palestinian Authority�and Europe to justify their war crimes against the population of Gaza. The USA preparation plan for the destruction of Gaza was presented to the Arab countries and Europe as a step to strengthen the President Mahmoud Abass and as a protection measure for their regimes from the growing danger of the radical Islamic of Hamas, according to the deluded American rhetoric. The Arabs leaders adopted this criminal plan, and finally we saw Tzipi Livni threaten the population of Gaza with destruction from Egypt during an official press conference with the Egyptian foreign minister Abdul Gheit. The Saudi Arabian King, who invited some Jewish Rabbis to a religion conference in USA, was seen together with George Bush in his farm in Texas. This illiterate king who hardly speaks a word in English and is known to only know street slang in Arabic, received from his ally George Bush the plans to destroy Gaza. It was demanded from him to cut the relationship with Hamas leaders. As a result of this visit, the Palestinian Muslims from Gaza were being denied their right of pilgrimage to Mecca. Finally, the Israeli President and war criminal Shimon Peres "justified" the plan to destroy Gaza in the newspaper Al-Sharq- Al-Awsat of Saudi Arabia. The corrupt and criminal Prime Minister Ehud Olmert justified his crimes on the Saudian Al-Arabiya TV. Finally, the American employee Salam Fayyad cabinet of collaborators imprisoned hundreds of Palestinian political activists in the West Bank as a preparation for the Israeli war crime against the people in Gaza. Last week the PA American trained forces jailed the Palestinian Rajab Awni Tawfiq Al-Sharif age of 36, a resistance personality who was declared dead after the Israeli strike in Nablus in 2006. 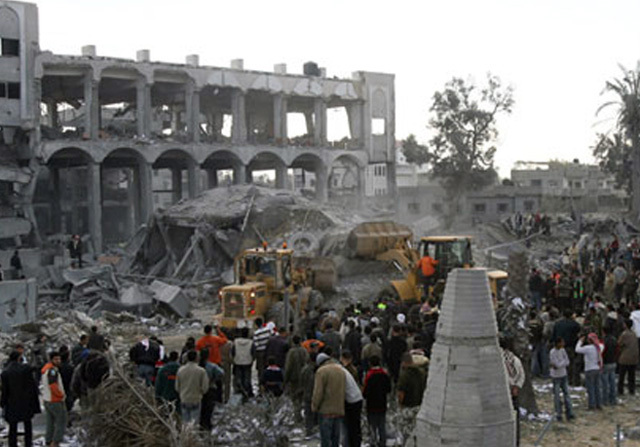 The PA had been informed by their Israeli partners in crime about the Israeli destruction plan against Gaza. They were demanded to jail all Palestinian political opposition as a preventive step before the destruction. President Mahmoud Abbas was in USA on December 18 2008 to discuss the final steps to implement the USA-Israel plan in the West Bank and Gaza. "Why did Fatah let Hamas win the small battle in Gaza, and how did the Israeli intelligence infiltrate the militant Hamas? It was not by accident that the PA and Fatah leaders were not in Gaza during the operation of the Hamas militants. It was not by accident that the PA officials from Gaza fled to Egypt, Jordan, Israel and Ramallah crossing EU- and Israeli-controlled borders at the beginning of battle with Hamas. It is known from past events that, whenever Dahlan or the Israelis arranged for the murder of somebody, Dahlan and selected people from the PA would run to Egypt for the length of these operations. Also, in "normal" times it takes on average 2 weeks for Palestinians to get an answer when they request a permit to pass the borders of Gaza for medical emergency cases, and it can take up to one month to receive an answer from the Israelis to such urgent requests. So, how did the Palestinian officers flee out of Gaza and arrive Ramallah in no time? This could not have happened without full help of the Israelis. During "normal" times the Israel was never helpful to Palestinians. There is no mercy under their occupation. Pregnant women are dying at the Israeli borders all the time, people sick of cancer are dying at their homes because they are not allowed to go to a hospital. But the traitors around Abbas and Dahlan were allowed free and unhindered passage. What will happen after the Fatah officers hand over Gaza to Hamas? What is the real deal between Dahlan-CIA-PA-Israel and the Hamas? Hamas did not win Gaza. In reality, Dahlan won by implementing the first stage of the CIA-Israel-PA conspiracy. Which will be the second stage of this Dahlan-CIA-PA-Israel conspiracy? Whatever happens, 1.5 million Palestinians live in Gaza and other further millions in the West Bank. The so-called "International Community", the European countries and the United Nations should be held responsible for any crimes and destructions which Israel will commit or cause to be committed in Gaza and the West Bank against Palestinian civilians. The smell of a conspiracy and disaster spreads out of Gaza"
"The suspicion is that the second stage of this conspiracy will be that Hamas shoots some rockets at Israel so as to give them an "excuse" to bomb Gaza flat - "Palestinians" from Lebanon have already done so - while the upper Hamas hierarchy escapes to Egypt leaving poorly armed fighters there to be liquidated together with many other civilians. Israel�s new-old minister of "defense", Barak, has already announced that they are contemplating a full-scale invasion of Gaza with 20.000 troops, air force, hundreds of tanks � At the same time, the Hamas death squads, under protection from the IDF, will kill everybody on the Israeli hit lists in the West Bank. The only peace which Israelis know and understand is the peace of the cemeteries, and this is why Olmert called Abbas� new "emergency" government "partners for peace". With the help of the USA, Europe, Egypt, Jordan and Saudi Arabia, possibly millions of Palestinians will now be butchered, as has always been intended." 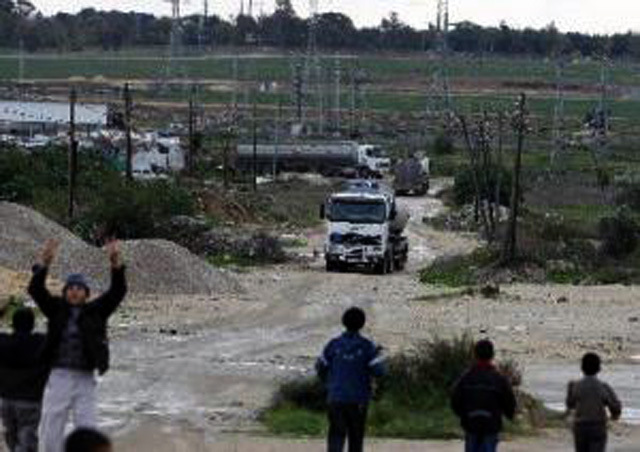 "What started in Gaza today will happen in the West Bank sooner or later. The plans for genocide and ethnic cleansing against Palestinians have been written in the 1880s, and Israel is not about to refrain from those plans by itself. Abbas, Dahlan, the King Saud and other Arab leaders will receive their "thank you" from Israel in the form of a knife in the back, and they know it. The pressure from the USA on all these traitors would not be effective by itself to make them sell out not only the Palestinians, but to accept Israel". Last month and before the Palestinian-Israeli truce ended in Gaza, the Israeli government opened an exhibition to sell the presents which they received from Arab countries. These expensive presents, which the former director of the Israeli Mossad received from Arab countries and showed in the Israeli exhibition shows the shameful face of the Arab leaders and their regimes. As a Palestinian following the news of the Israeli exhibition, I felt shame about the behavior of these Arab leaders, I felt shame to be an Arab. How I can understand and explain this scandalous, shameless behavior? The conspiracy of these corrupt people who sold not only themselves but all of us while dealing with the enemy of all humanity has blinded us. We always thought that there was a minimum of decency in their dealings, that certain lines would not be crossed. After all, have these countries not suffered enough due to the Israeli crimes? Have they not been subject to decades of terror by Israel and the USA? 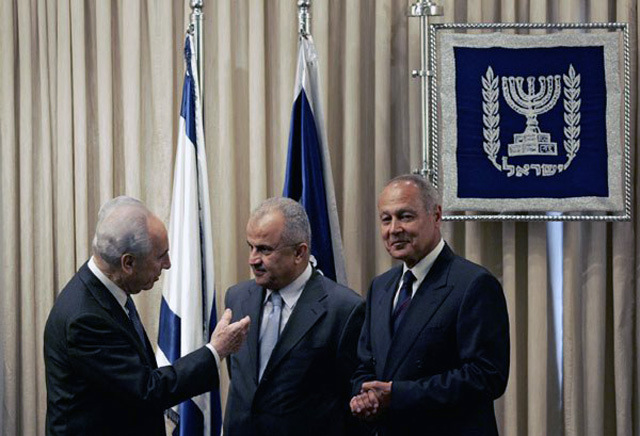 This means that Arab leaders see in Israel, ruled by a regime of psychopaths, "a place for people like us", and that the Abbas regime "serves up the country as booty" to the pathological Israeli regime, and that Israel must use "never-ending outside force" in order to assure the existence of the pathologic Abbas regime. Lastly, the silence of the world before the vile crimes of Israel say something about the governments of these nations being made up of pathologic characters who espouse a morality and values which are very different from those of the majority of the inhabitants of these countries.